The War of 1812 prompted the United States to build a long line of forts along the East Coast for national security. 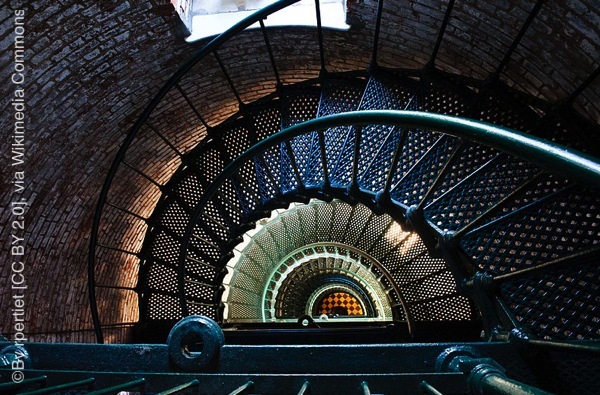 Built by the U.S. Army Corp of Engineers, Fort Macon was designed to protect Beaufort Harbor, a deepwater ocean port. The fort is five-sided, built of brick and stone, and quite striking. Twenty-six vaulted rooms called casements make up the substantial fort, with walls that are almost 5 feet thick. The fort became active in 1834; at the beginning of the Civil War, the Confederacy of North Carolina wrestled the port away from Union soldiers. The fort was recovered by Union soldiers in 1862 and served as a federal prison for both civil and military prisoners from 1867 to 1876. 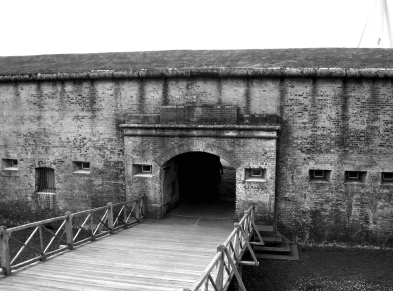 Fort Macon was officially closed in 1903. The state of North Carolina purchased the fort from the federal government in 1923 and turned it into a state park. It was reactivated for a brief period during World War II as a coastal defense base. Visually appealing, the fort and surrounding park lie on one of North Carolina’s most beautiful barrier islands. The park is fully restored and open to the public. Besides the fort, there are areas for fishing and swimming, nature trails to hike, a refreshment stand, and beautiful scenery on land and sea to enjoy, which makes the fort and the park one of the most visited parks in the state, reportedly receiving more than 1 million visitors each year. In 1862, Union forces attacked the fort, and even though the Confederate soldiers were completely surrounded, they refused to surrender. The fort was besieged by heavy gunfire for 11 hours straight, and cannon fire struck the fort more than 500 times. By the next day, the fort was under such strain that the commander, Colonel White, was forced to surrender. While the fort had been able to easily withstand gunfire, cannons quickly penetrated the barriers. Some reports state that Civil War ghosts haunt the fort, including Confederate soldiers who keep watch for approaching Union soldiers. Others state that the ghosts are former prisoners. Witnesses report seeing soldiers strolling outside the fort and items moving within several rooms inside the fort. There are also sounds of footsteps, gunfire, and men speaking in low voices. The fort is beautiful in its own way, and the five-sided shape is intriguing. Exhibits and displays include the fort’s powder magazines, counterfire rooms with cannons, and furnace and bake ovens. Some quarters have been restored to show how soldiers and officers lived there. While touring Fort Macon, I didn’t experience any paranormal activity. It was a gorgeous day when we visited the area, and everyone there was enjoying the beautiful weather. Some of the techniques used in ghosthunting include checking for increased solar activity, which has been reported by many paranormal researchers to cause an increase in paranormal activity, as spirits need an energy source in order to appear. When the sun has a solar storm or is releasing solar flares, radioactive particles enter the Earth’s atmosphere, which charges the geomagnetic fields. Ghosts can then access this energy, which allows them to be more active on the earth plane. Moon phases have also been studied, and certain phases, including the full moon cycle, often produce more ghost sightings and paranormal activity. During my visit, the geomagnetic field was quiet, and solar storms were low. I was also there during a low lunar cycle. I didn’t detect any paranormal activity to note other than the usual energy imprints I pick up any time I’m near a battlefield. This doesn’t mean that the fort is not haunted; it just means that I didn’t encounter any activity during my visit. As with any paranormal investigations, it often takes time and repeated visits to a location under the right conditions to find proof of ghostly activity. Locals and visitors continue to report ghostly experiences while visiting, and I hope to return again to investigate further. Want more spooky stories of Ghoshunting in North Carolina? Check out Kala Ambrose’s book Ghosthunting North Carolina. 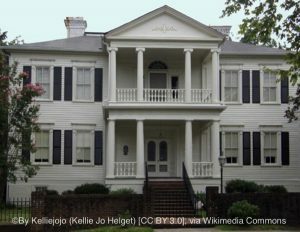 The Fayetteville Women’s Club is located in the historic Sandford House on Heritage Square, which was built in 1797. Apparitions of a lady dressed in black have been reported in the house since 1900 and are still being reported by some of the ladies of the Women’s Club. 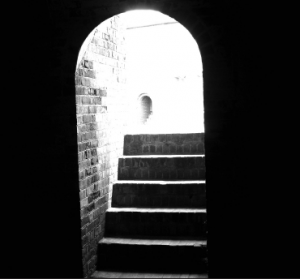 The “lady in black” frequently appears on the stairs, and many believe her to be Margaret Sandford, who lived in the house in the 1800s. But others believe in a much different tale. One evening at the Sandford House, a Confederate soldier was visiting his true love. During this visit, news arrived stating that Union soldiers from Sherman’s army were close to taking over Fayetteville. Hearing the news, the young soldier was desperate to get to his regiment in time to help protect the bridge over the Cape Fear River. 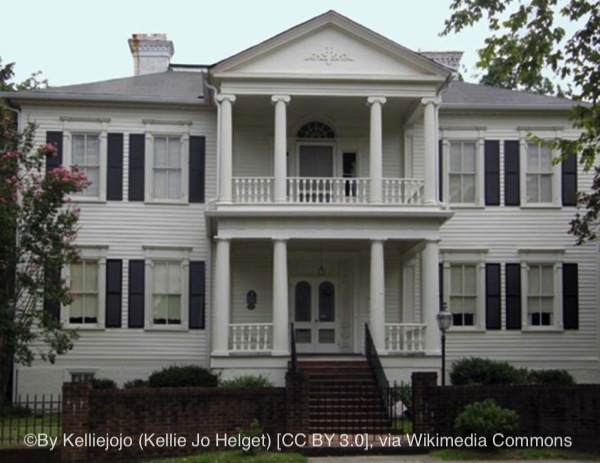 The Sandford House had a secret tunnel inside that led to the Cape Fear River. The soldier’s beloved led him to the tunnel entrance so that he could reach his men and help protect Fayetteville. She wished him a safe and speedy return; night after night, she waited for him to come back to her through the tunnel entrance. The battle raged on, and the young soldier was never seen again, nor was his body ever found. When the ghost of this young lady is seen, she appears in a long black dress, which all the ladies wore at that time as the color of mourning for their lost husbands, sons, and lovers. Reports state that the lady in black is often seen walking up and down the stairs, anxiously waiting for her lover to return to her home. Many witnesses have reported seeing her in several locations throughout the home, and they often feel her hand on their shoulder as she reaches out to them from behind. The legend states that some of the ladies of the Fayetteville Women’s Club believe that she touches them gently to have them turn to face her so that she can see who is in her home. Perhaps she also hopes that they will have some news for her regarding the soldier’s return. The lady in black is reported to be gentle and sad. She appears to be patiently waiting and grieving. Her state of dress indicates that she may have received news that all the men in the battle were confirmed dead, but since his body was never found, she has a glimmer of hope that he may have survived and against all odds will return to her one day. 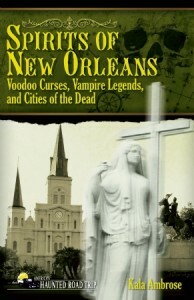 About the author: Kala Ambrose shares her love of history, travel, and the spirit world in her books Spirits of New Orleans and Ghosthunting North Carolina. 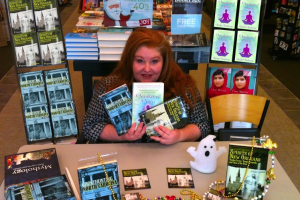 Her books are designed to explore the history of cities in an entertaining manner while sharing haunted stories and offering travel tips on how to best see the cities to shop, dine, stay, and visit the haunted sites. Visit her on her website Explore Your Spirit. The North Carolina coast is one of the most dangerous of the Atlantic for ships. The unpredictable and treacherous currents and ever-shifting sandbars have run more ships aground here than anywhere else along the Eastern Seaboard, giving the North Carolina coast the nickname Graveyard of the Atlantic. This is why so many lighthouses were built in the state, as a warning to sailors as they approached the coastline. Built in 1875, the Currituck Beach Lighthouse is located to the north of Bodie Island and was the last major lighthouse erected on the Outer Banks. 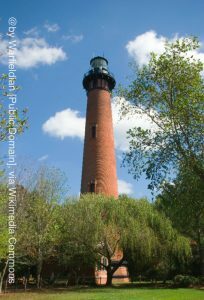 Its most distinguishing feature may be that it remains in its original brick form, rather than being painted in a bold black-and-white pattern like most other North Carolina lighthouses. Each lighthouse hired what was called a “keeper,” a man who would care for the lighthouse and ensure that the light was in good working order at all times. A small cottage was built next to each lighthouse in order to house the keeper and his family. Once construction was complete on the lighthouse and cottage, the first lighthouse keeper for the Currituck Beach Lighthouse settled into the cottage with his wife and their daughter, Sadie. Sadie slept in what is referred to as the north bedroom of the cottage. 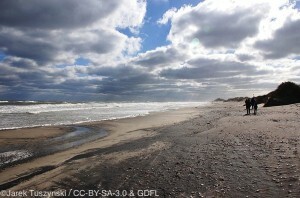 One day Sadie was playing on the beach and went missing. Her body was found washed up on shore the next day. Shortly after her demise, people reporting seeing the ghost of a little girl appearing around the lighthouse and the cottage. Rumors began to spread that the keeper’s cottage was cursed and that illness, misery, and death fell to anyone who slept in the north bedroom. Over the years, lighthouse keepers and their guests who slept in the north bedroom reported seeing and feeling a ghost in the room, and several became ill while sleeping in the room. Until recently, it was unclear why so many spirits appeared in this area. In 2009, after a ferocious winter storm along the Outer Banks, waves from the Atlantic Ocean dredged up a shipwreck, placing it at the edge of the shore. The ship appears to be from the early 1600s and may be the oldest shipwreck ever found along the coast of North Carolina. East Carolina University (ECU) students, underwater archaeologists, maritime history experts, and members of the North Carolina Wildlife Resources Commission worked around the clock in a race against the tide to pull the shipwreck farther up the beach to safety. The ECU team continues to work on identifying the ship; most recently, coins were found with fleur-de-lis symbols on one side and the image of King Louis XIII on the other. While the name of the ship, along with her crew and passengers, has not yet been identified, such a large ship most likely was carrying a full load of goods and passengers. The ship sank more than 200 years before the Currituck Beach Lighthouse was built near its underwater grave. It’s very likely that the ghostly passengers wandered the coast of Currituck Beach for hundreds of years and now make the Currituck Lighthouse and keeper’s cottage their home. Many also suspect that young Sadie may have been lured into the ocean after seeing one of the ghosts in the water, which led to her drowning. 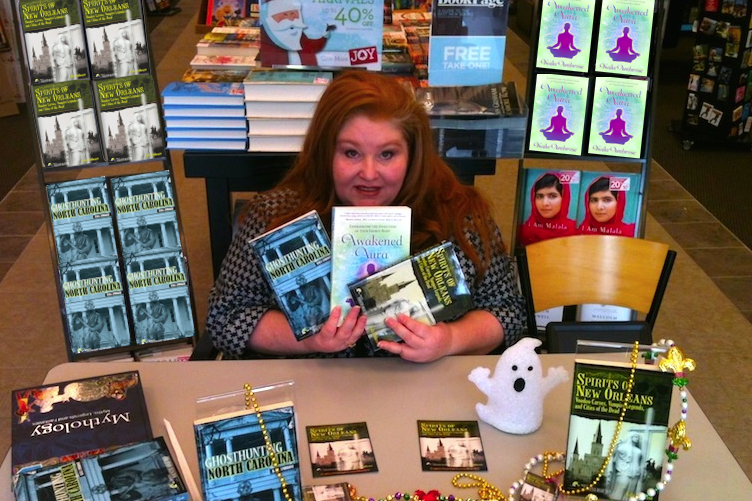 Kala Ambrose, author of Spirits of New Orleans and Ghosthunting North Carolina, shares with us what the spirit world can do. Since my childhood, I have seen and felt ghosts and restless spirits. Through my many experiences with the supernatural and paranormal realms, I have interacted with powerful beings of light, faced encounters with beings from the dark side, and seen ghosts from every walk of life. I run into ghosts in many places, and they all have a story to tell. I share my experiences in my books, and I also teach through my school, The Academy of Mystical Arts and Spiritual Sciences, where I show people how to become more intuitive, how to connect with the other side, how to sense negative energy in a home or building, and, more importantly, how to discern whether the energy can be removed and cleansed or whether it is best left alone. Over the past decade, I’ve seen a rise in paranormal activity, which is connected to the veil between the earth plane and the spiritual realms lifting at this time. I believe that a conscious evolution is occurring on the mind, body, and spirit level; as this evolution continues, and with this energetic shift, I believe that many people will connect with their intuitive abilities and be able to communicate with the spirit world, including with ghosts, which have remained on the earth plane. I head out west into the Blue Ridge Mountains, where the ghost known as the Pink Lady and her friends await your presence at the historic Grove Park Inn, where many presidents, celebrities, and ghosts have stayed over the decades. 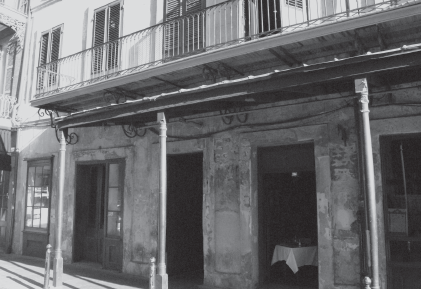 Don’t even get me started with everything I experienced in New Orleans—that’s why it took me an entire book to share some of the most captivating and haunting stories in the city! 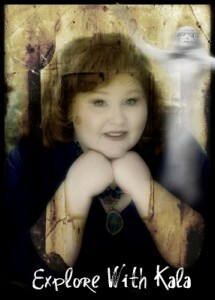 I’ve learned a lot over the years of interacting with the spirit world, and not every encounter has been smooth. I once lived in a haunted house where the ghosts weren’t friendly or ready to move on into the light. I learned about what the spirit world can do first-hand, and it was a very powerful lesson. In my early 20s, I was looking to rent a house and came across a listing that sounded perfect. I met the owner, who led me to the back of the property where the house was located. It was a charming little cottage with a spiral staircase leading to the bedrooms on the second floor, exposed brick walls, and hardwood floors. I fell in love—quickly–and like other times when I’ve fallen in love, I stopped thinking and became blind to everything else around me. For a brief moment, I thought I felt something supernatural inside the house. But in my excitement, I quickly dismissed it. The owner said he had other people who were scheduled to look at the house later that day. Worried that someone else would grab this gem of a house, I signed a contract and the deal was done. As I unpacked, I chatted on the phone, inviting friends to come over to see my new place. The days passed by peacefully, until I woke up one night with the feeling that someone was inside. Terrified, I walked from room to room with a baseball bat in hand, ready to club anyone I saw. I found nothing undisturbed and chalked it up to being in a new house, which always has strange sounds until you get used to it. On Friday evening, my friends arrived to celebrate my new home. We were downstairs enjoying a glass of wine when the noise began. We heard music from what sounded like an old scratchy record begin to play and the sound of heavy boots and someone in high heels clicking as they danced on the hardwood floor in my upstairs bedroom. My friends and I looked at each other in shock as we listened to the unmistakable sounds coming from upstairs. Gathering our courage, we crept up the stairs to see who was up in my room, but when we entered the bedroom and turned on the light, no one was there. We searched several times, thinking someone was playing a joke on us. Once we would calm down and go back downstairs, the music would start again. This became a regular occurrence every Friday night and was apparent that this was a ghost haunting the home. At first, it was almost endearing—two sweethearts, locked in an embrace from the past, dancing together. I thought the ghosts were a time loop, like a tape that played over and over. Soon after, my theory was proven wrong, as the energy in the house began to change. I discovered that while I was welcome here, men were not, and there was a definite “other-worldly presence” in the house that was growing more and more active. My boyfriend and I began to quarrel. I got blamed for things I hadn’t done. He’d accuse me of moving his things or hiding them. One day, he yelled and said that I had pushed him while he was in the shower washing his hair. I was downstairs at the time in the kitchen cooking, and when he realized there was no way I could have pushed him, he couldn’t live with the rationalization that something else might be in the house that he had no control over, so we broke up. I also began to notice that even when male friends came over to visit, they quickly grew agitated and angry after only being in the house for a short visit. Chatting with the neighbors, I learned that no one had lived in the house for years before me. It had been empty for so long that the spirit who was living here had grown weak and dormant. Once I moved in and had people over, it began to pull energy from everyone who entered it; while it was fine with me living there, it would not tolerate another man in the home. Having seen what the spirit world can do, I knew not to stay and hope that things would change. I could now clearly feel the energy of this spirit, and it was not interested in crossing over to the other side or finding peace. I called the owner and said, “I want to break my lease and move.” When he asked why, I told him about the angry spirit. I didn’t expect him to believe me, but to my surprise, he let me out of the lease. He explained that shortly after moving into the home, he and his wife began to fight. Before six months had passed, they were engaged in a bitter divorce. They had learned that a main house had stood in the front of the property and had mysteriously burned down. The cottage where I was now living was the original servant’s quarters located in the back section of the property. The present owner had never understood why he was so angry when he and his wife lived there and why they had fought so much in the home. He later rented the house out to his niece; six months later, she and her husband also divorced. The house had stood empty until I moved in; within six months, the relationship I had been in had dissolved too. My ability to explain the presence in the house allowed him to finally understand what was going on. We parted ways with him wondering if he would ever rent the place out again. I don’t know if he did rent the cottage out again, but I heard through the grapevine that the house caught fire several years later and that the damage was so severe that the house was torn down. For my part, I learned a valuable lesson: Always check the energy in a house before you live in it, no matter how much you love the décor and style. That’s probably good advice for most things in life. About the author: Kala Ambrose is “Your Travel Guide to the Other Side.” An award-winning author, spiritual teacher, motivational speaker, host of the “Explore Your Spirit with Kala Show” and practical intuitive coach and guide, Kala’s teachings are described as empowering and inspiring. Author of five books, including The Awakened Psychic, she has taught thousands how to connect with their soul paths and create lives and careers that are balanced and in tune with their life purposes and goals. Study online with Kala through her school, The Academy of Mystical Arts & Spiritual Sciences and visit her website. The Outer Banks of North Carolina are incredibly haunted. With so many shipwrecks and people lost at sea, ghostly images are often seen walking along the shore. While the shifting sandbars and unpredictable currents caused the majority of shipwrecks along the coast, many others were caused by pirate attacks at sea. The legend of Nags Head reveals an entirely new threat to sailors, what some might describe as the darker side of the mother of invention. According to local legend, wannabe sea pirates (landlubbers by day) wickedly designed their own special style of pirating. They would gather their horses, hang lanterns around the horses’ necks, and walk the horses up and down the dunes at night, attempting to lure ships into the area. The lights hanging from the horses’ necks led the merchant ships off course, as it appeared that the lights were coming from ships close to the shore. As the ships changed course and headed toward the lights, they ran aground on sandbars. The “land pirates” would then storm the ships and steal the cargo. The legends state that the coastal area where this occurred was named “Nags Head,” due to the reputation gained by the land pirates’ fast footwork with the horses and the lanterns. Others claim that the town was named by English settlers from a similar area in the Isles of Scilly off the English coast. Ghosts often appear all along the shore of Nags Head. Some say they are the crews of the ships plundered by the land pirates, and others say that they are former guests of the hotel, looking for it below the sand. A third theory for the ghostly appearances states that many of the historic cottages in the area had porches built onto their homes using lumber salvaged from shipwrecks that washed in from the coast. The ghosts connected to the lumber from these ships now remain near the homes. They are attached to the timbers from their ships and are still looking for the rest of their ships to wash up on the shores, along with their lost treasures and belongings. Regardless of which ghosts are roaming the area, a visit to the Outer Banks and Nags Head provides many haunting opportunities. 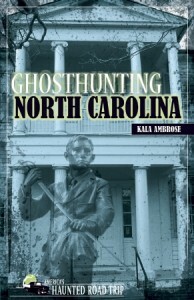 Enjoy Ghosthunting North Carolina, by Kala Ambrose, from the safety of your armchair, or hit the road using the maps, ghosthunting travel guide, and other resources. Buckle up and get ready for the spookiest ride of your life. If you want to hang with the locals, catch a Saints game at Jean Lafitte’s Bar, where you’ll hear what’s really going on in the city of New Orleans. 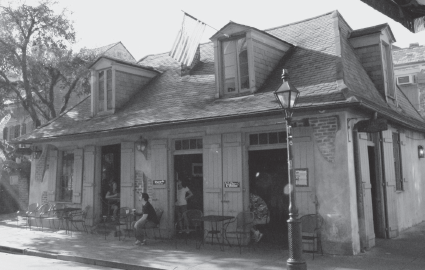 Try the Voodoo Daiquiris, which are made with fruit juice and are much tastier than some others you’ll find on Bourbon. They are so delicious that I’ve been known to try many of them—for research purposes, of course. Some people report seeing red eyes floating over the fireplace area inside the bar. There are also tales of a woman who appears in a mirror. The charming bar is lit by candlelight, and you’ll feel transported back in time. Anyone with psychic abilities will pick up on the energy of the place. Paranormal researchers also come away with a variety of orbs and mists appearing in their photos. When Napoleon was captured and imprisoned on the Isle of Saint Helena, a group of Frenchmen in New Orleans began to plan his rescue. They decided to acquire a yacht and sail to the Isle of Saint Helena, where they would participate in a daring rescue and bring Napoleon to New Orleans to live out the rest of his life. One of the men involved with this plan was Nicholas Girod, the mayor of New Orleans from 1812 to 1815. Girod offered his home to Napoleon to live in upon his arrival. Many meetings regarding the rescue attempt were discussed here at Girod’s home, which began to be referred to as the Napoleon House. For more than 200 years, it has served locals and travelers alike with food and drink, while maintaining its historical significance. Regarding the haunted history of the house, more people are apt to tell you that it has been haunted more by living artists and writers. Try the Pimm’s Cup, a gin-based drink, while at the Napoleon House. The recipe remains a secret, and it’s tradition to try one. The Sazeracs made here are wonderful as well. You can buy the mixes to make Pat O’Brien’s hurricanes and Pimm’s Cup at home, but everyone says (and I’ve tried it myself and agree) that they never taste the same at home like they do while in New Orleans. So it’s best to leave the making of these cocktails to the professionals. Beethoven, a fan of Napoleon, composed “Eroiqua” in honor of the emperor, and the classical music is played today in the Napoleon House. 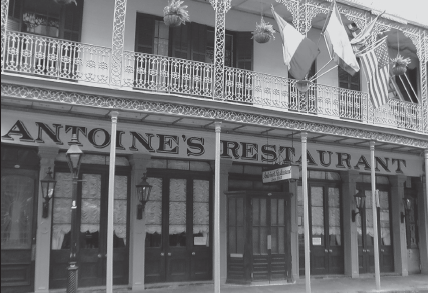 The Napoleon House has appeared in movies, including The Curious Case of Benjamin Button and Runaway Jury. 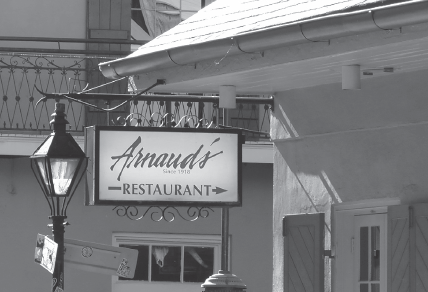 Antoine’s is a family-owned restaurant that opened in 1840 and has been offering exemplary service and French Creole cuisine since its inception. With more than 14 dining rooms, the restaurant is capable of holding up to 700 guests at a time. Several of the dining rooms are named after the Carnival krewes, which include Rex, Proteus, and the 12th Night Revelers. A krewe is an organization or club that puts on a parade or special event during Mardi Gras season. One of the reasons that the restaurant is thought to have been so successful is the legend that every family member involved in Antoine’s restaurant has encountered the ghost of Antoine in one form or another. Reportedly, he looks after the restaurant and keeps a watchful eye on the operations to ensure that the finest quality is still being preserved. Guests and some staff members have also reported seeing the ghost of Antoine. By all accounts, as long as there is an Antoine’s restaurant, Antoine himself will be there to look after the staff and the guests. To be part of the in crowd at Antoine’s, ask to be seated in one of the back rooms when calling for reservations. You will be dining with the locals. It’s the custom here at Antoine’s that if you enjoy a particular waiter, you can ask for his card to ensure that you can book a table with him on future visits. At Antoine’s, you must try the Pommes de Terre Soufflés, which are the most delightful puffed potatoes! They come out hot and puffy, and they must be eaten immediately to savor them. Once they are cooled, they are not the same, so enjoy them quickly. When dining at Antoine’s, the waiters will recommend that you take a tour after your meal and walk around the other rooms of the restaurant to take in the sights. Take them up on this offer, as it’s wonderful to see the history, including photographs of the Duke and Duchess of Windsor, Judy Garland, Pope John Paul II, Presidents Roosevelt and Coolidge, Bob Hope, Bing Crosby, and others who dined here. George Vanderbilt was 25 years old when he purchased the property in the late 1880s. In 1895, he officially opened the estate with an elaborate housewarming party for family and friends on Christmas Eve. The house was his dream for a country retreat where he could pursue his “passion for art, literature, and horticulture.” In 1898, he married Edith Dresser; after their honeymoon, they moved to the estate. Even after they moved in, work continued on the home. Edith and George were very much in love, and it was said that they complemented each other very well. They had one daughter, Cornelia, who was born in the home, and it appears that they had an idyllic life, enjoying the best the world had to offer. In 1914, George had an appendectomy and died from complications resulting from the surgery. Shortly after his death, servants in the home noticed that Edith began spending a lot of time in the library and that, while she was in the library, she was speaking out loud to George’s spirit. At first, they dismissed this act as a woman in grief over the death of her beloved husband. They assumed that after a period of time she would move on from her grief, after finishing her discussions of things that she had wished to say to George before his untimely death. Instead, the opposite happened. Edith continued her daily conversations with George, and during this time servants in the home began to notice the presence of his spirit, mostly in the library and in his favorite sitting room on the second floor. According to the legends, many of the servants heard footsteps and then saw an apparition of George around the home. The ghosts of Edith and George Vanderbilt continue to converse in the library of Biltmore Estate. After Edith died, the legends continued, as the servants reported hearing the voices of both Edith and George now conversing in the library. Perhaps now that they were joined again in the afterlife, they were able to pick up where they left off and enjoy their time together in their treasured home. Reports continue today from staff and visitors who hear voices in the library and a few other rooms. 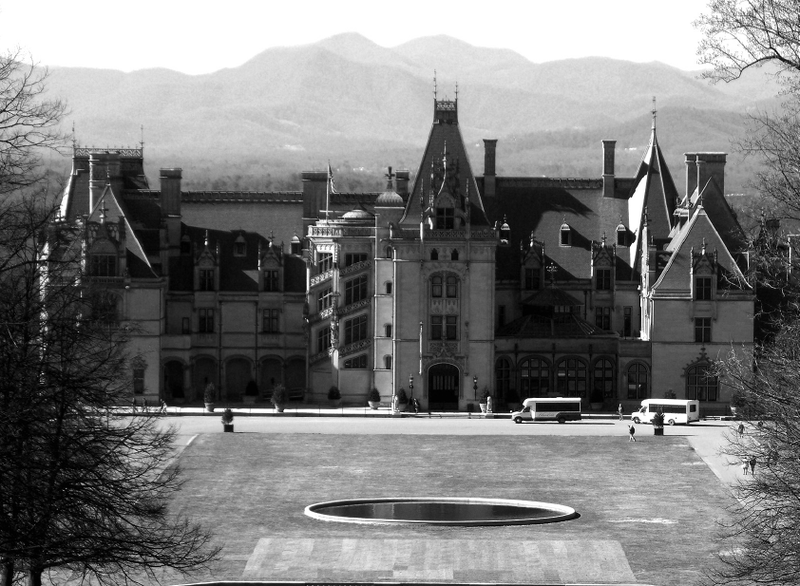 There are quite a few ghost stories about Biltmore, which some locals shared with me during my visit to Asheville. Several employees answered my questions, as well, as long as I agreed to keep their identities off the record. 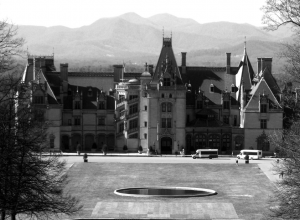 Officially, Biltmore does not discuss haunted or paranormal activity in the home or on the property. Also, photography is not allowed inside the home. The only spirits that they will officially discuss are the spirits of the wine made at the Biltmore winery. For more haunted tales from the Tar Heel State, join Kala Ambrose, author of Ghosthunting North Carolina, as she explores each site, snooping around eerie rooms and dark corners. The Cornstalk Hotel was originally built as a home in 1816 for Judge Francois Xavier-Martin, who is best known in Louisiana as a former chief justice for the Supreme Court. The home was designed according to his wishes, but records show that several homes had previously been built on this property, beginning in 1730. Each of the previous homes had been destroyed by fire, most likely by the two Great Fires of New Orleans—the first that destroyed 90% of the French Quarter and the second that destroyed more than 200 buildings. The records of who owned the homes before Judge Martin are missing (some were destroyed by fire), but it is assumed by most historians that several families lived at this location over the decades. 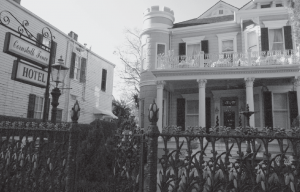 The tale of the haunted Cornstalk Hotel begins with a husband’s love for his wife. In 1834 Dr. Joseph Secondo Biamenti purchased the home for himself and his Iowa bride. He ordered a cast-iron fence to be installed around the property. 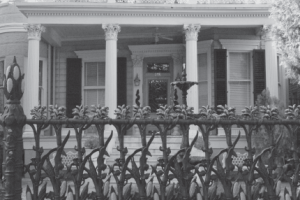 In New Orleans, lovely homes with cast-iron balconies and fences are features found in great abundance on every corner of the city, so the chosen material on its own is not what has made the Cornstalk Hotel famous. What causes this building to stand out in the French Quarter is that the cast-iron fence resembles cornstalks, as if one was looking out at a field of corn made completely from cast iron. Each column of the fence is anchored with a pumpkin. Climbing up each iron post are vines, leaves, and flowers, until you reach the top of the post, where cornstalks are partially open to display the kernels of corn inside. The effect is whimsical, and the artisan must have worked long hours to shape iron into such delicate and intricate pieces, which include a butterfly landing on the front gate. The good doctor loved his wife dearly. Knowing that the swampy soil in New Orleans would never allow a field of corn to grow, he did the next best thing he could to bring an Iowa cornfield to his wife: He designed a unique fence that would remind her of home whenever she looked out the window. Architecturally, the hotel is fascinating. It is listed in a multitude of travel guidebooks as a must-see location to photograph in the city. This hotel meets that list for other reasons, too, including the legends of ghosts haunting the building. Guests have reported hearing children laughing as their footsteps pitter-patter back and forth inside the house and outside. There are also reports of hotel guests hearing the sounds of someone tapping on the window, only to find no one there when they pull back the curtain. They also report doors opening and closing in the middle of the night. At the hotel, I was psychically drawn to spend time outdoors rather than inside. The iron fence is quite captivating, and there is something almost electric about it. Iron was used in cemeteries, as it has a reputation of keeping spirits inside the area surrounded by iron or preventing them from entering an area surrounded by an iron fence, as ancient tales state that spirits are not able to cross over iron fences and gates. This particular iron fence vibrated with an energy that I had not noticed elsewhere in the French Quarter. The fence emanated a blue hue, as if it was magnetized with an energy field. It had the look and feel of a spell, as if someone who knew what they were doing had magically placed a charm on the fence for purposes yet unknown. As I tuned into the fence to determine what energy had been placed there, I followed the blue auric field and saw that it surrounded the property. Protective spells had been placed in this field to shield the hotel from any harm. The hotel certainly has a warm and welcoming feel about it. If you are standing in front of the fence from the street and want to see this blue energy field for yourself, you’ll find that the left side of the fence has the most energy, as if it wants to protect itself from energy coming from that direction. On the right side, the energy field is much more open and relaxed, appearing to not detect any harm coming from this side. This right side of the property is where the ghost boys are most often seen playing on the lawn. As I continued to study the fence and the supernatural energy attached to it, I had the distinct feeling of being watched. I looked up at the hotel and saw a woman looking out at me from an upstairs window. I gave a friendly wave to her, thinking she was a guest, until I noticed that she was wearing a dark dress with a lace collar at the neck and had her hair pulled back into a tight bun. My first thought was that she was dressed in period clothing, perhaps for an event at the hotel. This thought soon vanished, however, for as I stood there looking at her, she disappeared into thin air, except for one of her hands, which remained there at the window for a few moments longer. She appeared to me as someone who was very protective and inquisitive about the comings and goings at the hotel. My encounter with the woman was very brief. She was quite a distance away, as I was outside near the fence looking up and she was upstairs inside the hotel, so there wasn’t a strong connection. The one thing I did feel strongly, however, was that she was not the wife of Dr. Biamenti. This woman appeared to be dressed more in the style of the late 1700s rather than the mid-1800s, when Dr. Biamenti and his wife lived in the home. Most likely she was an occupant of one of the previous homes that burned down. About the author: Kala Ambrose is an award-winning author, national columnist, inspirational speaker, and host of the Explore Your Spirit with Kala Radio and TV Show. Kala Ambrose’s teachings are described as discerning, empowering, and inspiring. For more haunted tales from New Orleans, check out her book Spirits of New Orleans: Voodoo Curses, Vampire Legends and Cities of the Dead. 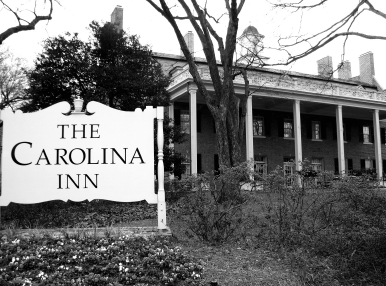 The distinguished Carolina Inn was built in 1924 to attend to visitors and alumni of the University of North Carolina. The architecture of the building was patterned after that of George Washington’s home in Mount Vernon. The ballroom of the Carolina Inn is considered to be one of the most haunted areas of the inn. Perhaps it’s second only to Suite 252, where Dr. William Jacocks lived for almost 20 years. He’s been reported to be a friendly ghost and very welcoming. Guests report that even in the absence of fresh flowers in the room they will be welcomed with an overwhelming floral scent. Others will be greeted with a strong cologne smell. Dr. Jacocks is known to be a fun-loving prankster. He reportedly enjoys playing tricks at the inn, including locking guests out of Room 252. The local lore states that at one time, the door had to be taken off its hinges because it was so stuck it wouldn’t open under any circumstances. 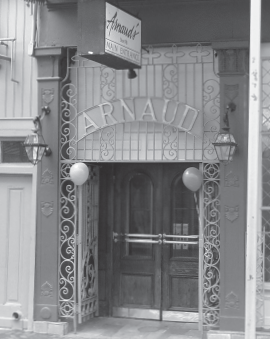 Electronic locks were installed in the hotel in 1990, but there continue to be repeated complaints of the door refusing to unlock. Other guests have reported all sorts of paranormal activity in the room, including curtains being pulled open in a wild manner and icy spots in the room, even when the air-conditioning is not running. Staff at the inn report seeing a man appear in a black suit with a blue overcoat and knit hat walking around the inn. He reportedly goes from door to door touching and jiggling the knobs. Some guests have reported hearing the sound and opening the door to see what the man wants, only to watch him disappear before their eyes. Some reports claim that there are up to 20 ghosts at the inn. Witnesses have heard the sound of a piano playing in areas where there is no music or musical instruments. Others have heard footsteps in empty rooms. Voices have been heard, orbs recorded, and sightings of ghosts are reported around the inn on a frequent basis. The inn’s owners are comfortable with the reports and host a yearly Halloween event that includes a ghost tour and an overnight stay and dinner to discuss the activity in the hotel. The ghosts have all been reported to be friendly and enjoy the inn so much that they refuse to leave. The Carolina Inn is owned by the University of North Carolina and listed on the National Register of Historic Places, so once again, you know it’s going onto my National Register of Haunted Places list. The inn is full of yummy Southern hospitality, and the staff is warm and welcoming; it’s no surprise to me that guests would want to stay for a lifetime and beyond. With 184 cheery and beautifully decorated rooms and a wonderful location by the university, it’s often referred to as the University’s Living Room. During my visit to the inn, I enjoyed walking around the property. The most widely reported incidents of ghostly activities are inside the building, but to my surprise, where I felt the most activity was around one of the doors. He is felt in the suite as well as around the inn and enjoys playing a few pranks. While touring the inn, I felt a ghostly presence playing with the door here. As I walked through this door, I was looking down at the ground. I had felt a strange energy in this area, and while focusing on this energy I nearly dropped my camera and reached out quickly to grab the strap. While doing so, it felt as if I bumped solidly into a person. Startled, I stepped back and looked up to apologize to the person whom I had run into, only to find myself completely alone. I looked all throughout the room, but there was no one to be found. The entity that I bumped into had felt as solid as a man. Unfortunately, whoever it was, it had no desire to communicate further with me and did not appear again. Perhaps I had startled it as much as it had startled me. One never knows quite what will happen next when ghosthunting, and the majority of the time, it seems to happen when you least expect it. 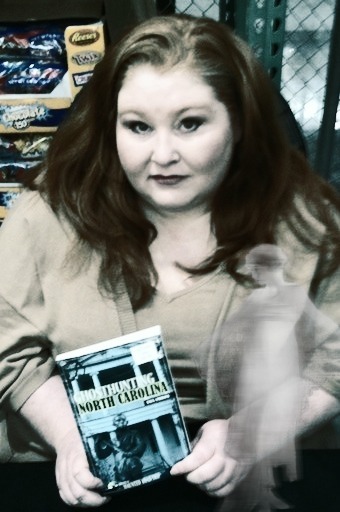 In her book Ghosthunting North Carolina, author Kala Ambrose explores the most terrifying paranormal spots in the state.